Hundreds of forgotten British victims of failed Icelandic bank Landsbanki are on the brink of losing their homes after a four-year legal battle. Some are retired expats living in Spain and are involved in a last-ditch court fight to stop their properties being repossessed by the liquidators of the bank, which collapsed in 2008. The pensioners owe thousands of pounds on an equity release scheme run by the Icelandic bank and sold through unscrupulous financial advisers. Money Mail revealed the pensioners’ plight shortly after Landsbanki collapsed in 2008. The Luxembourg-based liquidators for the bank want this money to pay other creditors. But the pensioners, most of whom retired to the Costa del Sol, claim they were mis-sold and should not have to pay. Many are trapped in homes that have plunged in value, and have seen their dream retirement blighted by debts and expensive legal costs. Among them are Carolyn and Henry Bowen, both 63, who live in Benamargosa, near Malaga. 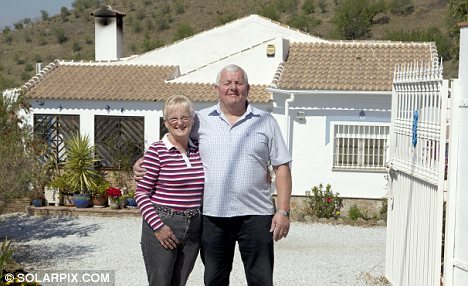 They signed up to the equity release investment in 2006 through a British financial adviser working in Marbella. They were told the scheme would allow them to cut their inheritance tax bill under Spanish law and help pay for Mrs Bowen’s treatment for breast cancer. They took £300,000 from their three-bedroom country villa, and invested £278,000 of that in a fund run by Landsbanki. But when Landsbanki collapsed, they were left unable to pay the 6.5 per cent interest on their equity release loan and the money in the fund was frozen. Since then, liquidators have been allowed to take £280,351 from the fund to pay off some of the borrowing, and have hiked the interest on the remaining debt, which has now spiralled to £175,236 due to interest and charges. The value of the couple’s property has plunged and is now worth £250,000. Mrs Bowen, a retired headteacher, says: ‘It seems like a nightmare that will never end, I wake up worrying in the night. The Landsbanki scheme allowed pensioners to borrow 100 per cent of the value of their homes. They could take up to three-quarters of the money as a loan and invest the rest in a fund. They were told the return on the investment would pay off the interest on the borrowing and provide an income for life. And, unlike with normal equity release plans, interest had to be paid every month. These schemes, banned in the Britain since 1990, were flogged by unscrupulous advisers who targeted Britons living in the Costas. But when Landsbanki collapsed at the height of the credit crunch, the investment return plunged, leaving the pensioners with huge interest bills they could not repay. These pensioners were not the only victims of the collapse of Landsbanki — 300,000 people who saved with its UK subsidiary Icesave had their money handed back to them through the Financial Services Compensation Scheme. The Icelandic government still owes the UK £3.4billion for this bailout. The Bowens argue they should never have been sold equity release in the first place. In a hearing last year, Spanish judges found in their favour. Landsbanki’s liquidators and the financial adviser were told to remove the mortgage and pay them £23,000, but the liquidator is appealing against the judgment and is dragging them through the courts. If they lose, the Bowens will have to fork out hundreds of thousands of pounds and see their pensions swallowed up in huge legal fees. If they win, however, it could mean the estimated 300 other pensioners in the Landbanski schemes no longer have to pay up. The European Commission is considering launching an ombudsman to help expats such as the Bowens, who feel exploited by unregistered firms. Money Mail understands Landsbanki’s liquidators have since offered a settlement to some equity release fund victims. But they may still have to pay tens of thousands of pounds and they will not receive any compensation for mis-selling. This entry was posted in In the Media and tagged Antonio Flores on March 14, 2012 by admin.